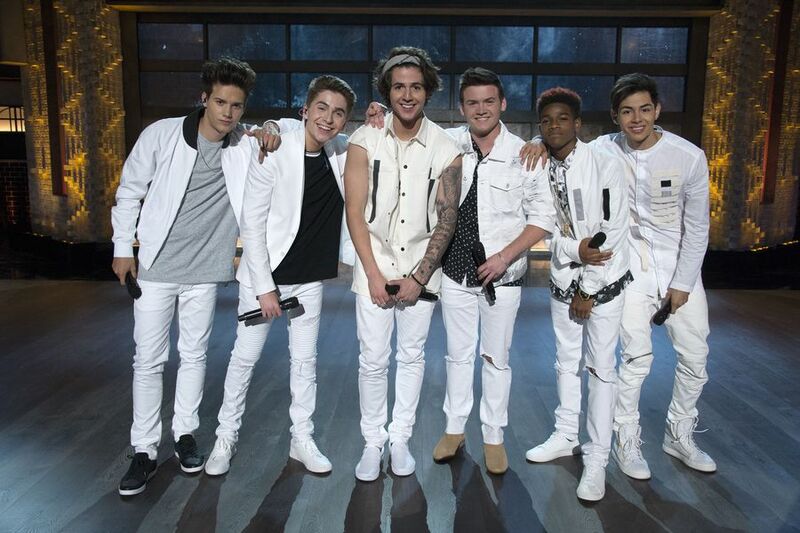 Sixtrack: Michael Conor, Gavin Becker, Miles Wesley, Andrew Butcher, Dorian Tyler, Mikey Jimenez. From the beginning, Boy Band Architect, Timbaland, said Sixtrack featured a lot of great "solo" artists. But could they come together as a group? Architect Nick Carter pointed out that Sixtrack featured the youngest members in the competition. Would age play a factor? Or when it all comes down to it, maybe they should simply heed Emma Bunton's advice and just "have fun!" Before getting down to business, the Boys of Sixtrack blew off some steam with some B-Ball. And their first impromptu rehearsal started right there by the court. Performing Kanye West's "Heartless," with Michael on violin and Andrew on guitar, the Boys were in perfect harmony. At vocal rehearsals, Boy Band Vocal Producer, Tim Davis, noted that Mikey was currently only using a small part of his amazing vocal range, and he was determined to help him find the full range of his great voice. Tim was also impressed with "rapping violinist" Michael's improvement with his vocals, as was Boy Band Musical Director Adam Blackstone, later in music rehearsals. Not so good news for Miles, who was having a difficult time navigating the fine line between being a solo singer, and fitting in with a group. It seemed the pressure and stress were really getting to Miles, who had to leave rehearsal. Unfortunately, a feeling of disconnection with the whole group continued at choreography rehearsals with Creative Producers Nappytabs and choreographer, Sagiv, who said, "It feels super disconnected between you guys. Like nobody's looking at each other, nobody's having fun with each other…nobody's even looking at each other. There's no acknowledgement whatsoever." After a stage rehearsal, Nick walked over to the Boys to offer up sage words of advice, and help the boys get through their struggles, drawing on his years as a successful Boy Band member. When it came time to finally hit the stage and perform in front of a live studio audience, everything came together for the Boys of Sixtrack. They sang, "There's Nothing Holding Me Back," by Shawn Mendes. They even got Boy Band Host, Rita Ora, and Architect, Emma Bunton, in on the fun. After their performance, the Architects echoed what Tim Davis and Adam Blackstone had said earlier in the week, stating that Michael Conor's vocals were amazing, and this rapping violinist was quickly becoming a star. Gavin was told to "relax" a bit, and Mikey appeared to be a real fan favorite. Dorian was brought to tears when the Architects praised his performance. Despite overcoming a very difficult week, and truly coming together as a group, the Architects still had to send someone home. And for Week 3, we had to say good-bye to Gavin. UP NEXT: The LIVE shows begin next week! The Top 15 Boys will be put into new groups, and YOU, America, get to vote right here at ABC.com!